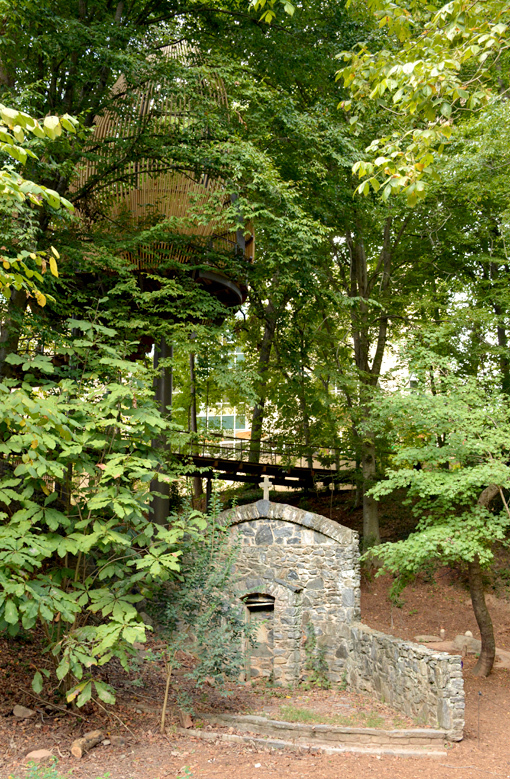 wanderlust ATLANTA: Fernbank's WildWoods is Wonderous! "Nearly a century ago, our founders formed Fernbank to preserve Fernbank Forest as a school in the woods for nature study. 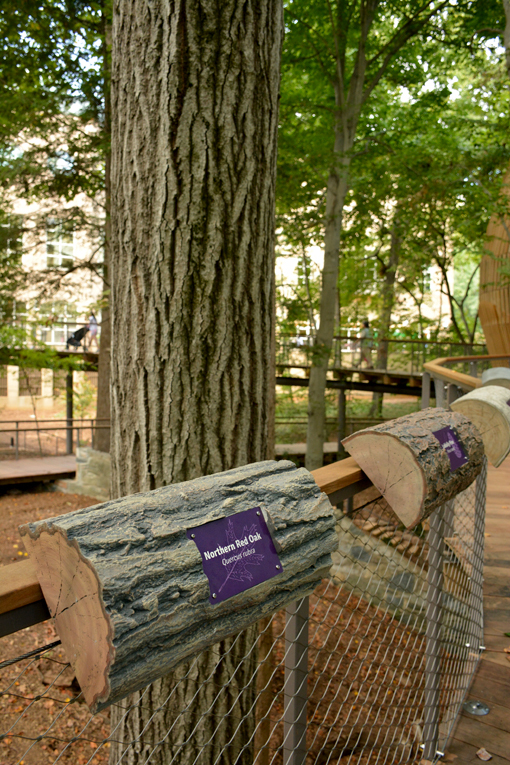 Now, connecting the museum directly to the forest through WildWoods fulfills our extraordinary legacy," said Susan Neugent, President and CEO of Fernbank. "At its core, natural history is about reconnecting humans to nature, which is why the living laboratory of learning in WildWoods and Fernbank Forest is so timely today." As a member of Fernbank Musuem of Natural History, I had the great pleasure of a WildWoods preview event last weekend. WildWoods is set to open to the public on Saturday, September 24, 2016 for a Grand Opening Weekend celebration, which is this weekend! I think you're going to love it...I already do. One begins their WildWoods journey on the Montgomery Highline Trace, an elevated boardwalk that winds through trees and over the terrain. 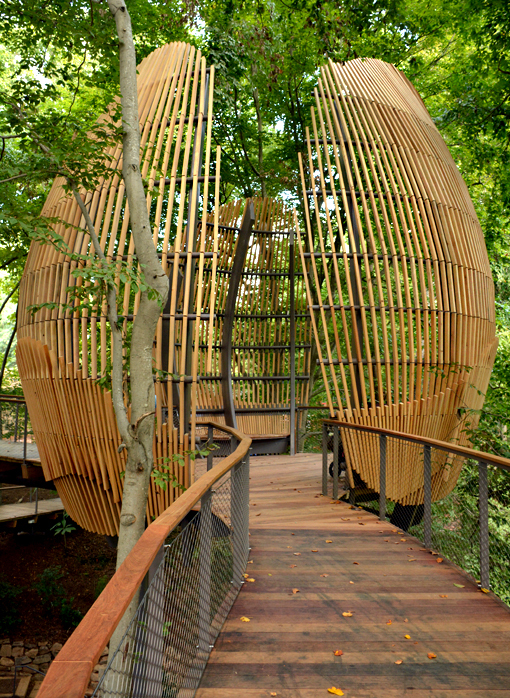 This walkway is highlighted by two nature-inspired tree pods nestled within the tree canopy—one representing a tulip poplar flower (pictured above) and the other represents a fern, both absolutely stunning as are the vistas from them. I love, love, love the Sensory Wall. The challenge presented here is for visitors to identify the various items on it suing only their sense of touch. What a wonderful learning experience! Admiring it for its beauty, I almost didn't touch it, then totally caved in...I just couldn't resist. I thought it was made from various kinds of stone, and perhaps there are various kinds of stone, but there's so much more! Go ahead...touch it and learn! Within WildWoods is an outdoor gallery, which I'm told will have changing exhibitions. For now there are Bug Hotels—You've really got to check these out! 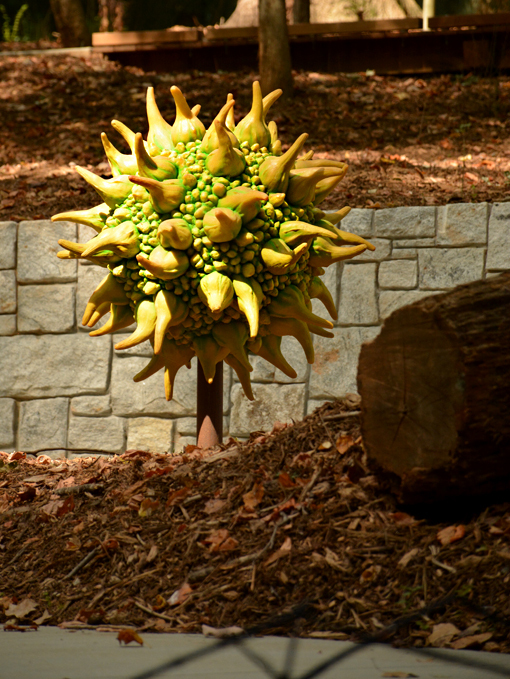 There awesome!—and Sweetgum Tree Sculptures, including the wonderfully wild one pictured above. I personally am super excited about the potential for this area. Part of the goal for this outdoor gallery is to include the community...that'll bring LOTS of possibilities! 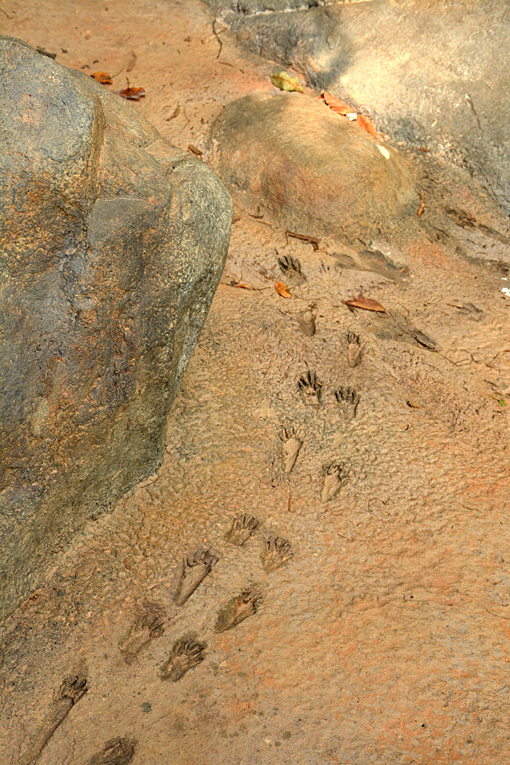 There are several places in WildWoods where there are purposely created animal tracks, a learning opportunity for children and grownups alike. And then there are tracks made by the creatures living in WildWoods which are fun to speculate about, unless you're already an animal expert. 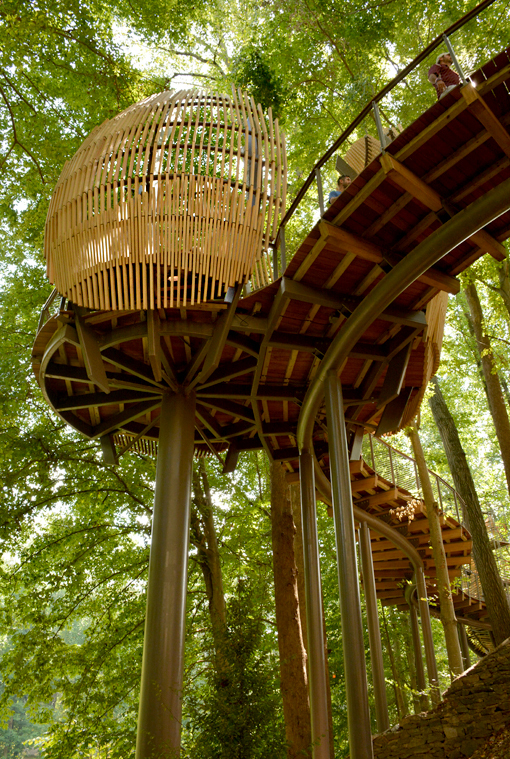 If you want to reconnect with nature, but can't get out of the city, WildWoods and Fernbank Forest may just be the place you're looking for! Just off the Tulip Poplar Flower Pod are a series of tree identifying markers—I love this! There are educational signs and markers throughout WildWoods, but they're done very tastefully and are not at all disruptive...you're having too much fun to wish they weren't there and if they weren't there I believe we would have missed them. Very well done, Fernbank! The Historic Stone Wall, which now you can walk next to, dates to the 1930s and once marked the northern edge of a formal landscaped garden. 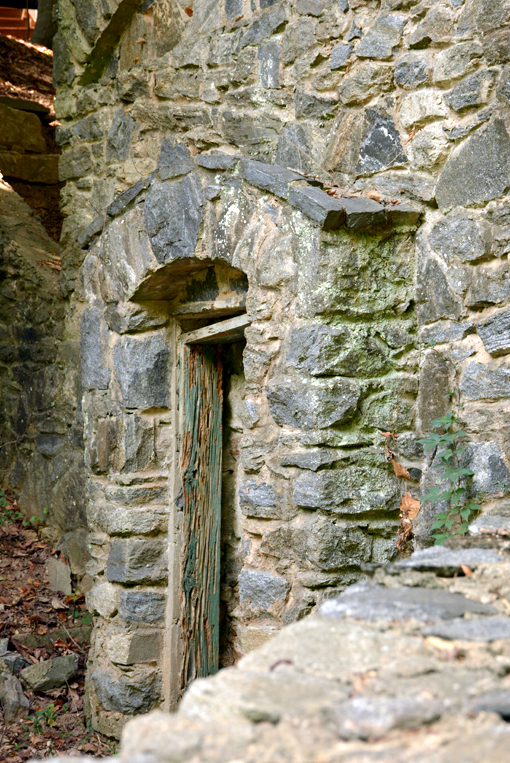 Among these ruins are stone stairs, pond foundation walls and a grotto with a cross. On the morning I visited there was a praying mantis perched on top of the cross. Mantises have natural camouflage, often making them difficult to spot, but the way the sunlight was streaming through the woods at the time I spotted that one, it was like a beacon! Not to worry though, they're not poisonous. I had the wonderful pleasure of an in-depth discussion of WildWoods with Deanna Smith, Director of Marketing at Fernbank Natural History Museum. The entire marketing team at Fernbank has been absolutely delightful to work with over the years and several made this day far more special than I'd expected. "Thank you!" It wasn't until I ventured down into Isdell Wildlife Sanctuary that I realized why Deanna finds it so charming and fascinating. 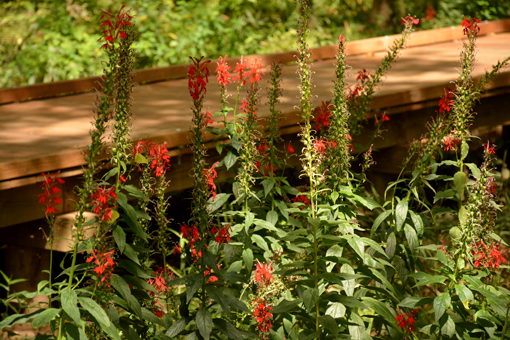 The boardwalk and an overlook gifts the eyes and other senses a restored creek meadow that attracts birds, butterflies (lots of them!) and other pollinators...and three otters have been spotted in the creek. This sanctuary is alive! This time next year, the Sanctuary will be even more lush and beautiful. 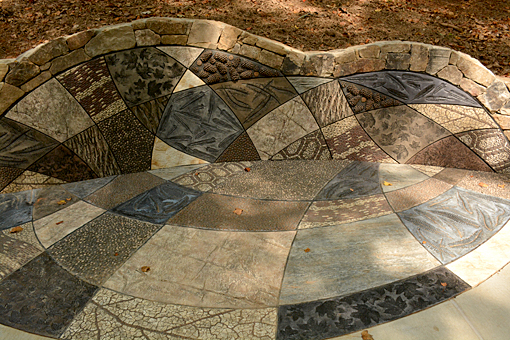 Fernbank has dedicated considerable time and resources to ensure its health and sustainability. But even without knowing that, it's still a wholly wonderful and peaceful experience. There are also designated children's areas, but I'll leave that to my family blogger friends, 365 Atlanta Family and Field Trips with Sue. The areas look like great fun, but I'm an 'old' kid, so I'm sticking to the elevated boardwalk, nature pats and outdoor exhibits! I'd like to offer a word of thanks to the Museum's volunteers. They truly enhance ones exploration. And the more I/you can learn from them, the greater our opportunity for a truly mind-expanding experience and the more fun we can have! Thank you, volunteers, for your time and for sharing your knowledge, experience and expertise. You're appreciated! 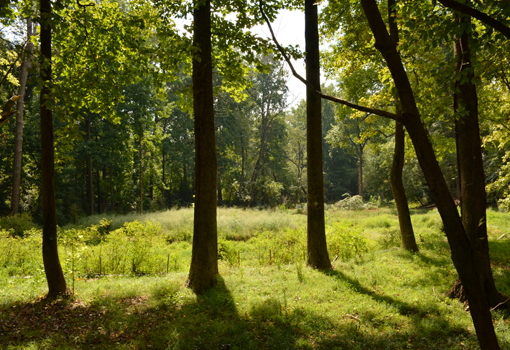 Fernbank Forest, which I'll discuss in detail in another post, is the largest old-growth forest of its kind in a major metropolitan area and is now directly connected to the museum through WildWoods...all 65 acres of it! There are lots of activities going on in Fernbank Museum of Natural History's brand new WildWoods this coming Grand Opening Weekend! A grand exploration of a magnificent 75 acres awaits you!